America is more police state than democracy. George Bush institutionalized it. Obama hardened his abusive practices. Downplay Michael Brown’s murder. Ignore militarized police repression. Arm state and local departments nationwide with more weapons than already supplied. Types used in war theaters. Militarized America threatens freedom. Turning city streets into battlegrounds. Washington provides police nationwide with enormous amounts of combat weapons, related equipment and supplies. 44,900 pieces of night vision equipment. Cops don’t serve and protect. They harass, threaten and terrorize ordinary people. Especially America’s most disadvantaged. Blacks and Latinos. Muslims. Immigrants. Unfairly targeted. At home or in public. Things go on commonly seen in ruthlessness dictatorships. Police state America replicates them. For millions of law-abiding people. “(W)artime weapons and counter-terrorism strategies mark a shift in the very nature of policing strategies,” said the ACLU. The ACLU estimates from 70,000 to 80,000 so-called “no-knock” raids annually. An astonishing 192 – 219 times daily across America. Up from around 50,000 2005 raids. About 3,000 in 1981. Bursting into homes lawlessly. Unaccountably. Unannounced. Often at night. Terrorizing residents. Including women, children, the elderly and infirm. Innocent victims. The vast majority of US police departments in cities of 50,000 or more have Police Paramilitary Units (PPUs). Around double the mid-1980s figure. Growth in smaller communities equally dramatic. Up fourfold since the mid-1980s. Militarizing police has nothing to do with ensuring public safety. Everything to do with targeting public anger. Preventing justifiable social upheavals. Crushing them when they erupt. Licensing police to kill. Thirdworldizing America. Maintaining inequality. The world’s largest gulag prison system. Incarcerating thousands unjustly. Protecting America’s ruling class from beneficial social change. Locking down greater Boston after the April 2013 Marathon mass casualty event is an example of harshness to come. Ordinary people went along instead of resisting. Martin Luther King called America “the greatest purveyor of violence in the world today.” Now more than ever. Threatening fundamental freedoms. Humanity’s survival. Fear-mongering proliferates. Big Lies are weapons of mass deception. Suppressing hard truths. People are manipulated to support what harms therm. Nonbelievers targeted ruthlessly. On December 1, Obama appointed Philadelphia Police Commissioner Charles Ramsey and former Assistant Attorney General Laurie Robinson to co-chair his Task Force on 21st Century Policing. “We were just dumbfounded when we heard they had chosen Chief Ramsey.” A thug by any standard. A serial civil rights violator. “You’d be hard-pressed to find a more inappropriate choice,” she stressed. Philadelphia’s gain is America’s loss. Obama intends instituting his announced policy by executive order. Unilateral diktat authority. “(T)o promote effective crime reduction while building public trust,” he claimed. Bypassing Congress. Militarizing America more than ever. Mocking fundamental civil rights. The 1997 fiscal year National Defense Authorization Act (NDAA) authorized supplying excess military weapons and equipment to state and local police. The so-called 1033 program. At least 8,000 law enforcement agencies participate. Receiving billions of dollars of military hardware since 1997. As part of Washington’s Defense Logistics Agency Disposition Services (DLA) transfer program. According to DLA, $449 million in 2013 alone. Ferguson unrest drew nationwide attention to what little was known publicly before. Including tanks on Ferguson streets. 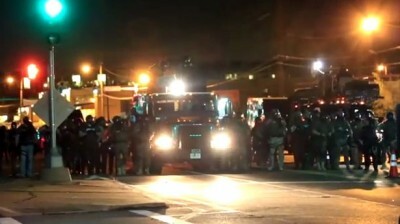 Heavily armed police threatening residents. Police brutality. Mass arrests. No-fly zone implementation to block helicopter news coverage. Suspension of First Amendment rights. MSM malpractice. Misreporting. Censorship. Oversimplifying. Whitewashing the worst of police violence. Misinformation spread through social media. Obama’s announced multi-agency review is farcical. Intending cosmetic changes at most. Saying “I do not want a militarized police culture in America.” While continuing Washington’s 1033 program. Militarization writ large. Turning city streets into battlegrounds. Making America unsafe to live in. Trampling on fundamental civil and human rights. Pretense claiming otherwise. Suppressing police brutality reports. Obama acknowledged widespread skepticism. Previous discussions and task forces accomplishished nothing. “Why is this time different,” he asked? “Because the president of the US is deeply invested,” he said. The same one mocking democratic values. Enforcing police state harshness. The most secretive administration in US history. Most repressive. Ruthless. Lawless. Waging war on freedom. Whistleblowers exposing government wrongdoing. Journalists doing their job. Immigrants. People of color. Muslims. America’s most disadvantaged. Ordinary people. Terrorizing them. While waging multiple direct and proxy wars of aggression. Ousting democratically elected governments. Preventing democracy at home and abroad. Challenging Russia and China irresponsibly. Recklessly. Risking global war. Humanity’s survival. Madness defines US policy. As head of state, Obama bears full responsibility. Big Lies conceal his recklessness.